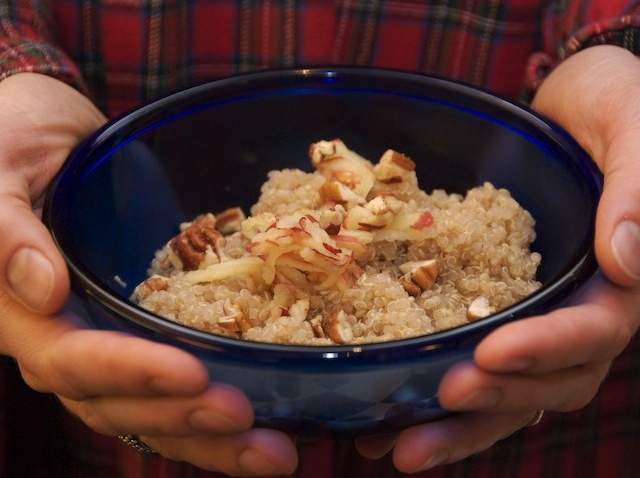 Quinoa has a very distinctive flavor that's a bit nutty. Its taste is unique and pleasing, although like any new food, it may take a few times to develop a taste and feel for cooking it. It's delicious as a quick cooking side-dish at dinner with butter, salt, and pepper, but also nice as a cooked cereal. It is light, easily digested, and has a good nutritional profile. It will also hold its texture when reheated as there is very little gluten. Leftover quinoa is delicious and slightly crunchy when added to muffin or pancake batter. Put the quinoa, water, salt, and cinnamon in a small saucepan. Bring to a boil, reduce the heat to a simmer, then cover the pan, leaving it slightly ajar so that it doesn’t boil over. Cook until you can see the spiral-shape germ in the tiny grains, about 15 minutes. (If there is an excess of liquid, you can drain it off, or simply stir it into the grain). Stir in the butter, and taste for cinnamon; add an extra shake if you like. Top with apricots and pistachios. Serve with milk, if desired. Read more in Deborah Madison's article about hot cereal breakfasts.